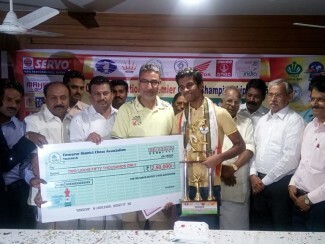 Sixteen year old Karthikeyan Murali of Tamil Nadu was crowned as the national champion, irrespective of the final roundloss to IM Arghyadip Das in the ONGC 53rd National Premier Chess Championship, organised by Tiruvarur District Chess Association at Kasi’s Inn, Tiruvarur, today. Things went in his favour, as Vidit drew his game to be on par with him, each having 8.5 points in the final tally. As direct encounter was the first tiebreak, the tenth round victory by Karthikeyan over Vidit stood in the former’s favour. 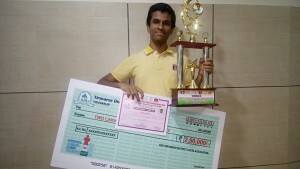 Besides winning a purse of two and a half lakh rupees, Karhtikeyan has become an automatic choice for the 2016 Olympiad. The 2015 edition of National Premier Championship is his second attempt and for the first time, he has played under the round robin format. In a tense encounter, Karthikeyan Murali, playing with black pieces, opted for the Pirc defence. Leading the charge with Austrian attack, IM Arghyadip Das of Railways played an attacking game with his rook stationed on seventh rank, supported by his knight. 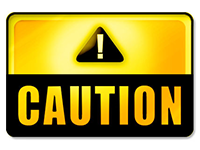 As a result, Karthikeyan had to play with a handicap of having one pawn less in the rook and pawns ending. Clever handling of his rook fetched the lone pawn of Karthikeyan to Arghyadip. Arghyadip’s two connected pawns delivered the verdict in his favour. When Vidit enjoyed a slight advantage with two extra pawns in the middle game of a Catalan opening, his opponent M. Shyam Sundar of AAI made a surprise bishop sacrifice offer under time pressure. In the process, Vidit lost the additional pawns and after exchanging the dark coloured bishop, each had two pawns on the board. Both kings were in perfect positions to force a draw after 52 moves. The draw ended the hopes of Vidit to clinch the title, after having led for most part of the championship. In the Bf4 variation of queen’s gambit by GM elect Swapnil Dhopade of Railways, the double bishop advantage of Neelotpal Das of PSPB failed to generate any advantage to him in the end game. Swapnil’s light coloured bishop and knight combined effectively and his three chain pawns on the king side paved way for Swapnil to post a win in 60 moves. 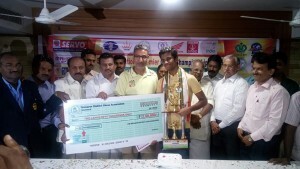 Rathnakaran of Railways had a resounding win over PSPB grandmaster MR Venkatesh in a Sicilian defence adopted by the latter, to push him into sixth rank, a criterion to be in included in the Indian team for various tournaments. Sethuraman’s title chances vanished in the air, when he had to concede a draw to Railways international master P. Karthikeyan in 30 moves of a Closed Ruy Lopez opening. After scoring a meagre half a point in five rounds, IM P. Shyaam Nikhil of Tamil Nadu found his touch to outwit Telangana’s K . Praneeth Surya in the Moscow variation of Sicilian defence. Shyaam tried to checkmate Praneeth by repeated knight sacrifice offers. Though Praneeth did not accept them, it culminated in the loss of two pawns to him. Shyaam needed 46 moves to win the game. Twice national champion Abhijit Kunte of PSPB split the point with his team mate Deep Sengupta, when Kunte had a bishop and Deep had a knight with five pawns each on the board. Shri Rajesh Saxena, Chief Manager (HR), Cauvery Asset, Karaikkal, was the chief guest and distributed the prizes in the presence of Sri V. Hariharan, Hon. Secretary of All India Chess Federation.